Grant created the Festival’s mascot, “Glen the Frog”(r), of which Grant designed more than 30 different styles. Each year the festival chair selects a new logo and updates its design and colors. The Come-See-Me festival has won many awards including the SC event of the Year. 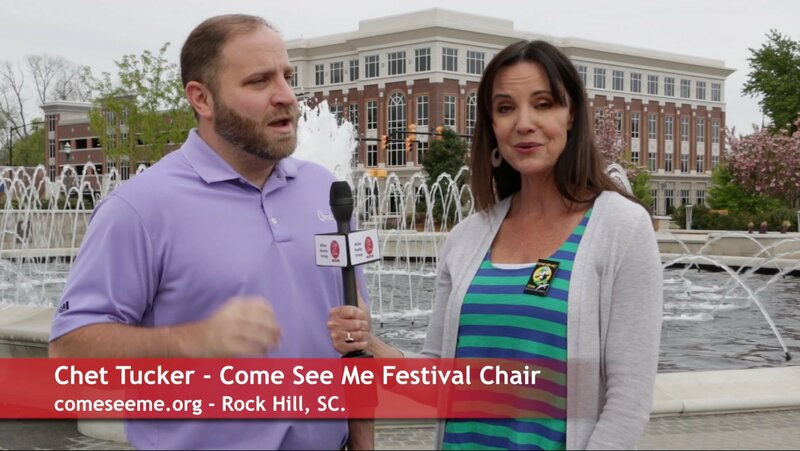 The festival is also considered the largest, all-volunteer festival in South Carolina. The Come-See-Me Festival kicks off with a parade, offers a Beach Bash, weekend of Gourmet Gardens, and various events throughout the week. For kids, events include a Teddy Bear Tea Party and the Mayor’s Frog Jump. Music lovers may enjoy several venues, from weekday lunch concerts in the gardens, to Moonlight Jazz, to a giant Tailgate Party featuring rock and country bands and ending with a fabulous fireworks display. There’s an “app” that! The Come See ME Festival has its own Apple or Android-based app with festival schedules, maps, event weather status and more. To find out more, go the festivals main website, www.comeseeme.org.? The hashtag to use for the festival is #csmfestival. Below is the 2018 festival schedule.